Beach Park Suites Resort Hotel, Fortaleza, Brazil details from BrazilBookers.com. 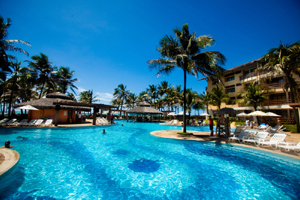 The Beach Park Suites offers 175 rooms within the Beach Park Complex which is adjacent to the water park situated at the beach and is 16 m away from Fortaleza. This hotel inaugurated in November 1996, is of international standard. Not only is it situated in a favorable location but, its infrastructure provides many different outlets to enjoy your leisure time. Some of the services this hotel provides are kid's club, internet room, beauty salon, pool bar, swimming pool, restaurant, theatre, saunas ,convenience store and a convention center split into four rooms with a total capacity of around 450 people. Beach Park Suites and Resort is the exquisite four star hotel on the beach of Porto das Dunas in the splendid city of Aquiraz, Ceara, Brazil. The location apart from being picture perfect for a fun vacation, is conveniently accessible being a mere 19 kms from the Fortaleza International Airport. Apart from the excellently comfortable rooms, the water park and water sports deserve a special mention. The blue world painted by the fun opportunities presented by these are enjoyed by kids and grown up alike. The water rides, wave pools and body boarding are all time favourites of the visitors. Insano, the four to five second, 134.5 foot drop at 65mph happens to be the star attraction amongst the rides. The 198 rooms are skilfully managed and maintained by the staff. For the convenience of the visitors, bilingual staff is employed during peak season of late December to end of carnival. Rooms have all the modern comfort facilities including air conditioning, microwave, and adapted restrooms. Staff is specially trained to instruct customers with special needs as to equipment safety. Travelling with family is always a matter inconvenience at many places, here though minute details are taken care of, like diaper changing stations! Buffet restaurants, four snack bars, snack carts ensure you have the best of the regional food and delicious ice creams. To pamper yourself, you have the sauna, swimming pool and the massage tent at your disposal. Kite surfing lessons, children's activities, babysitting services ensure you have nothing to complain about. Not to forget ambulance service, defibrillator, medical team consisting of doctor and nurses, you have nothing to fear in case of emergency. Traveller' greatest worry of cash and valuables can be put to rest by availing the in room safe. Shopping facilities for one and all; have a dip in the outdoor or indoor pool; let your kids enjoy in the kids club; tone yourself in the gym; do all you want to do under the sun. Laundry, dry cleaning, housekeeping, 24 hour room service; it is all taken care of. Starting from excellent location, to service minus complaints; exciting water rides to countless facilities; it is all there at the Beach Park Suites and Resort, Fortaleza. Availability of rooms can be easily checked on the internet and booking can be done conveniently using the same. You shall be welcomed with a warm smile and rest assured, you will leave at the end of your stay with the same smile on your face. When would you like to stay at Beach Park Suites Hotel ? 1) Rates at the Beach Park Suites Hotel may not be valid during Carnival, New Years, Easter and other special dates. © Copyright Bookers International, LLC. 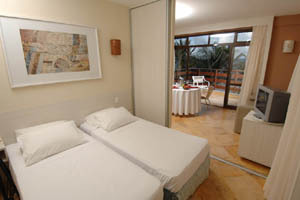 All Rights Reserved – Information on Beach Park Suites Resort Hotel, Fortaleza, Brazil details from BrazilBookers.com.